On entering the churchyard at Hamilton, the memorial is located on the east wall. 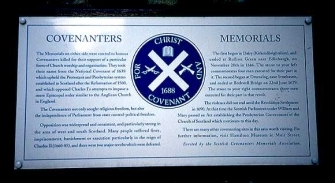 Next to it is the Earnock Covenanters' Monument, and a modern plaque. 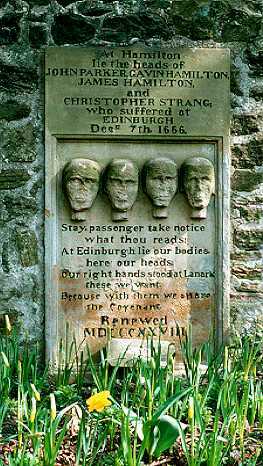 After the Battle of Rullion Green, four Covenanters were tried and sentenced to death, which was carried out in Edinburgh on 7 December 1666. Their heads were severed from their bodies and sent to Hamilton, where they were to be displayed on pikes. They were John Parker, Gavin Hamilton. James Hamilton and Christopher Strang.